Any emergency situation in a tree could become the one in which you save someone’s life. Performing an aerial rescue is not difficult, but knowing how to do it right is an essential skill on every job site. 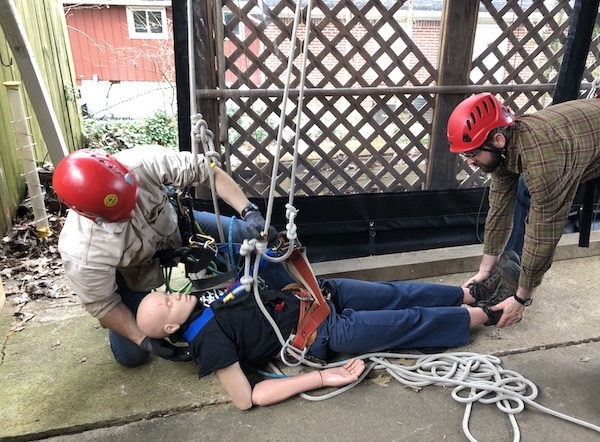 In Lowering "Rescue Randy" to the ground in a complex rescuethis one-day class, arborists will learn how to prepare for and perform simple and complex aerial rescues safely and efficiently, following well-established rescue protocols and procedures. Repetition is the building block of success. You will practice low-to-the-ground rescue techniques as many times as necessary until you have the procedures locked into “muscle memory.” When you understand and can perform the basic steps involved in each type of rescue, you will be well equipped to improvise and handle most rescue emergencies. This class is also appropriate for recreational climbers. Practical training: Each student will play the roles of rescuer, victim, and prompter/ground support following written simple and complex rescue scripts (protocols) in numerous practice sessions. Class Size: A small class of only three students ensures lots of personal attention and practice in a non-pressurized environment. Course Requirements: Must be able to climb with ropes. Course Materials: When you register for class, you will be emailed a detailed Course Manual that you must read prior to class. Because we want to make sure you are familiar with the material before you learn the practical techniques, you will also take a written multiple-choice quiz based on the material before attending class. Bring your answers with you. Quizzes will be corrected onsite. Other course materials will be distributed in class. Scheduling and registration: This class is not on our calendar, and can be scheduled at almost any time. Please call us (404-377-3150) to register. Location: Taught rain or shine at the TCI Clubhouse, 1290 Merry Lane NE, Atlanta, Georgia 30329. Gear: Students should bring their own saddle and helmet. TCI will provide other required gear. Course graduation: To pass this course, you must have read the Manual and passed the quiz. You also must be able to perform a simple and a complex rescue safely and efficiently, without guidance and according to the rescue protocols. Students will receive a “Certificate of Graduation” following course completion. Cancellation Policy: Anyone who cancels will forfeit the entire tuition unless you have someone who will replace you in the class.